Capture and remember the important Milestones and Moments of your Baby's first year. 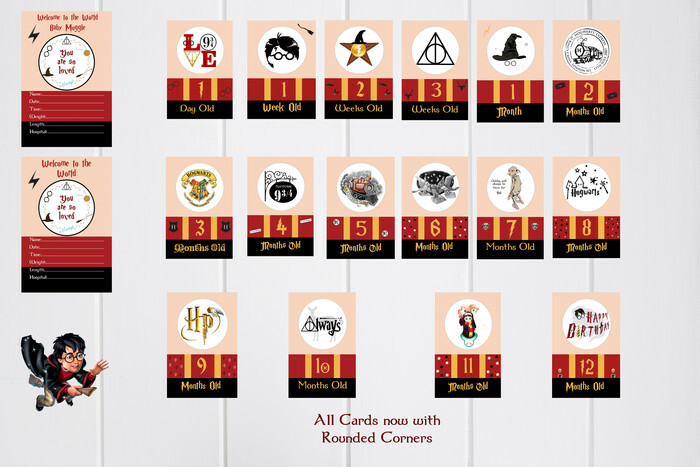 With these fun Harry Potter Baby Milestone Cards. 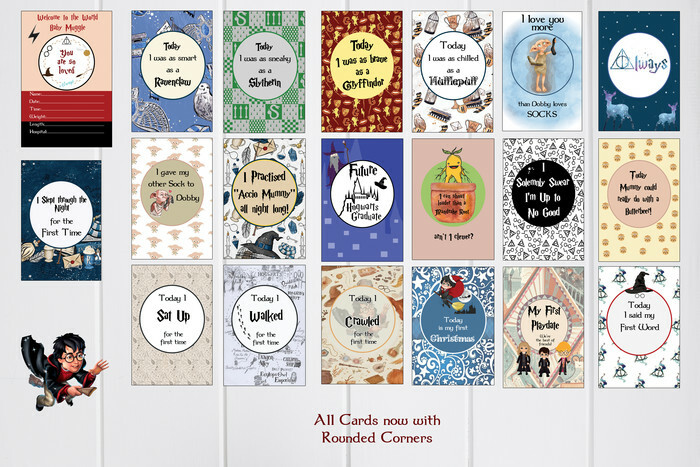 ALL CARDS ARE NOW MADE WITH "ROUNDED CORNERS" SAFER FOR BABY!! Baby Milestone Cards help to capture all of the special moments and milestones of your baby. There are 37 cards in this set which are professionally printed onto 350 gms card stock. Printed one side only. We can also print room for dates on the back of the card or any memories you wish to add on request. I practised "Accio Mummy" all night long! I can shout louder than a Mandrake root, Arn't I Clever? My first Playdate "We're the best of Friends"
As each Milestone arises, take a photo of the card with your baby to create a gorgeous keepsake! Each order will be wrapped and Packaged in a beautiful organza bag. For any questions please do not hesitate to ask. I will be as helpful as possible to make you get exactly what you want. We ship within 1 business days! If you need your order in a hurry or require tracking please select these options at checkout. All items are sent via Australia Post. Please be aware that Australia post can sometimes have delays around public holidays and weekends, please allow extra time if selecting free postage, all delivery times are only an estimate. Free Standard Shipping: We will cover the postage to standard post, No tracking number will be provided with this option. Free Standard Shipping plus signature: We will cover the postage and you pay for signature. Tracking number will be provided with this option. Registering your purchase will allow you to track your item and gurantee that you will receive it. (we highly recommend this option) Registered item cost to you is $4.00 you can select this at checkout!! So NO TRACKING is offered. If you wish to purchase tracking please send us a message and a quote for the tracking price will be sent to you......All postage through Australian Post!! Worldwide postage can take up to 3 weeks to arrive!! If you are not satisfied with our products, please contact us before leaving a neutral or negative feedback, so that we could try to resolve it first. If you wish to purchase tracking please send us a message and a quote for the tracking price will be sent to you......All postage through Australian Post!! Postage worldwide can take up to 1 to 3 weeks to arrive!!! If you are not satisfied with our products, please contact us before leaving a neutral or negative feedback so that we can try and resolve it for you first.